This week's focus takes us near Helena, MT to one of Montana's popular fishing and boating sites upriver from Hauser Dam. The park showcases great hiking around the dam as well one of the few public access points to Hauser Reservoir. A popular summer spot located approximately 7 miles outside of Helena and upriver from Hauser Dam, Black Sandy State Park is one of the few public parks on Hauser Reservoir. Looking for activities at the park? You won’t be disappointed! ✅ Spend your day on the lake boating, fishing, water skiing or tubing. ✅ Winter? Try your hand at ice fishing! ✅ Take a hike on one of the trails. ✅ Pack a picnic and enjoy the view of the lake. ✅ Take a bike ride to Hauser Dam! There are 29 campsites at Black Sandy and any with electrical hookups can be reserved in advance! Electrical hookups are available May 1 - November 30. Before planning your trip, be sure your trailer is no more than 35 feet. Black Sandy State Park also boasts one of the largest Bald Eagle concentrations west of the Mississippi during the month of August. But don't take it from us - here is what recent visitors had to say (with some park-specific tips just for state park supporters like you). "We camped on the lake for four days and never ran out of things to do. The swimming, fishing and boating was great. The Lookout Trail hike was a good hike to run the dogs and get a great scenic view of the Missouri River and Hauser Lake." "This is a beautiful place to camp and fish - go in spring or fall to miss the crowds - lots of boats out in the summer. Fun to fish and camp here." "It is beautiful !! Besides camping right on the lake, there is fishing, canoeing and a short bike ride to Hauser Lake Dam. Another bonus is that it is located only 7 miles north of Helena." "We just left after spending 6 days at Black Sandy. Sites 1-11 are first come first serve with 12 & 13 reserved for handicapped and rest of sites are reserved via the website or on phone. " "We made an RV site reservation 5 months in advance for the Park. I am glad we did. It's very popular. The RV sites are right on the water." 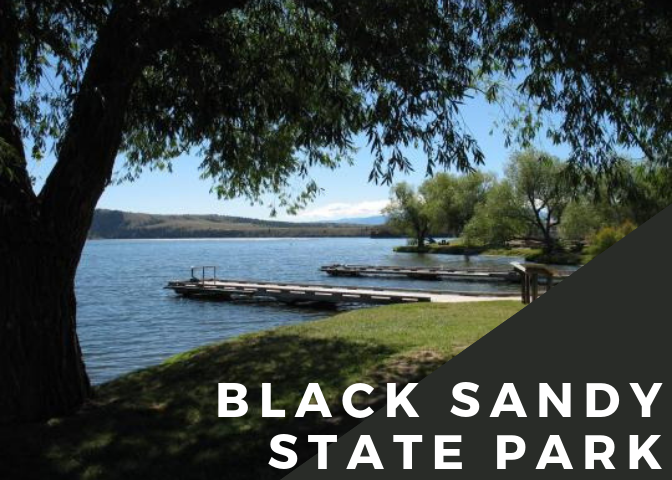 How Does the Foundation Help State Parks Like Black Sandy? As Montana State Parks only fundraising partner, the Foundation helps to raise awareness, education, and most importantly support boots-on-the-ground improvement projects for users and supporters like you. As an agency faced with a $22 million maintenance deficit, our work and collaboration help to ensure continued access and solutions currently inside our state park system. Because in the end, we envision state parks that reflect Montana's renowned outdoor recreation and heritage for all... forever.